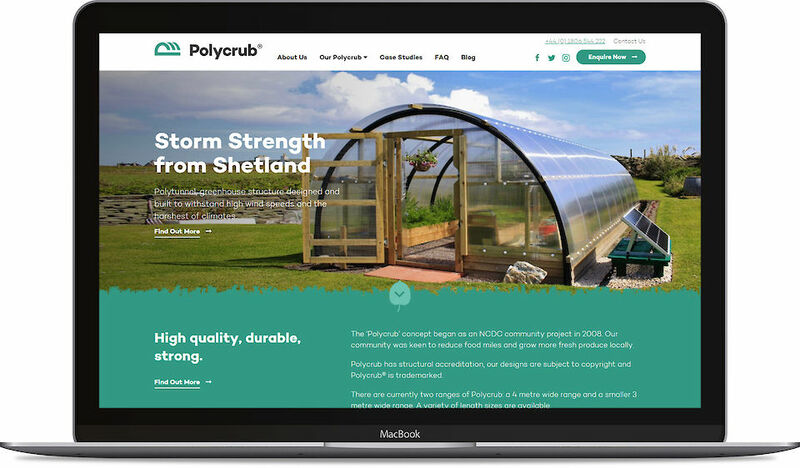 Polycrub is a social enterprise which provides polytunnel greenhouse structures in kit form. These are designed and built to withstand high wind speeds and the harshest of climates using recycled materials. What began in 2008 as a community project to reduce food miles and grow more fresh produce locally has grown into a successful business, which sees the company ship Polycrubs from Faroe to France. While Polycrub structures are popular in Shetland, and increasingly so in the Western Isles, Orkney and the Highlands of Scotland, the company are keen to expand their reach to other markets and establish brand dominance as the “go to” product in their field. The group required a visual identity with a strong personality which would assist in elevating their brand and associated with the price tag. NB created a modern brand identity, with a clever but straightforward concept which looks as strong as the product, is easily recognisable and conveys the high standard of Polycrub’s products. A new website was a crucial part of their wider marketing and efforts to reach new markets. Their existing site, a basic Wordpress blog, was unsuitable, so a brand-new website was required. NB created a site which conveys the group’s story, making good use of images, graphical elements, clear calls to action and a clean, modern design.